Discussion and Activity Guide for SMALL MEDIUM AT LARGE. Download the SMALL MEDIUM AT LARGE Discussion guide. Download the SMALL MEDIUM AT LARGE First chapter booklet. After being hit by lightning at her mother’s wedding, 12-year-old Lilah Bloom develops a new talent: she can hear dead people. Among them is her highly opinionated Bubby Dora, (her father’s mother) a prissy fashion designer, a mischievous, attention-seeking boy, and an approval-seeking clown who livens up a séance. With Bubby Dora leading the way, these and other ghosts haunt Lilah through seventh grade and help her face her biggest fear- talking to- and possibly going to the school dance with her crush, Andrew Finkel. In her debut novel, Joanne Levy has created a fun and tremendously entertaining story about trying to survive seventh grade. Lilah is a typical 12-year-old, with typical 12-year-old worries. She’s pretty but not gorgeous, smart, but not a genius, and she has a small circle of friends, but is not the most popular girl in school. Like many 12-year-olds, she also is experiencing her first major crush, but so far, hasn’t quite been able to find the courage to act on it. Small Medium at Large is told in first person, and Lilah’s voice feels completely authentic. Her narration is straightforward, honest, and witty, and she comes across as compassionate, intelligent, and likeable. She worries about her dad, who, as she describes, has done nothing to “get back out there” since the divorce, makes plans with her best friend Alex to form a band, (even though they have no instruments and can barely play) and has the usual worries about boys, bras, and bullies. When she develops the ability to hear ghosts, she takes it completely in stride and handles it gracefully and calmly. While the ghosts add a supernatural element to the story, Small Medium at Large is not a ghost story. 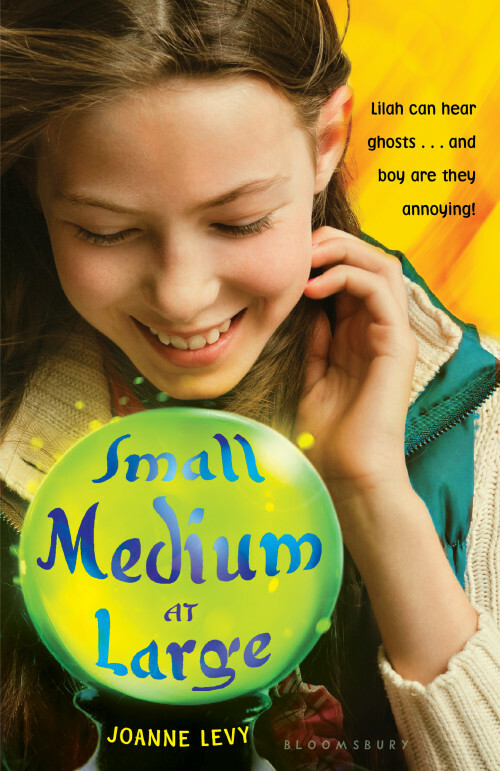 It is a realistic, coming-of-age story, and the ghosts act as guides who help Lilah navigate tricky situations. It is also a strength of the novel that the ghosts each have distinct personalities, and each of them has a purpose. The primary ghost, Bubby Dora, is an amalgamation of the author’s great-grandmother and mother, and she provides Lilah with a much-needed female influence. With Bubby acting as both a friend and a guide, the interactions between Lilah and her Bubby are sweetly and comically written, and readers will enjoy the close bond between them. Through her interactions with the ghosts, Lilah learns about showing compassion, following dreams, handling bullies, and most importantly, she learns what she’s capable of. The novel is tightly-written and fast-paced, the dialogue is clever and funny, and the story flows well. While there are some discussions of kissing and dating, there is nothing in it to make it inappropriate for a fifth-or sixth grade girl, and Small Medium at Large is a perfect read for every girl who is struggling or has ever struggled to fit in. A lively preteen develops the “superpsychic” ability to converse with the dead, complicating her seventh-grade life in this lighthearted debut. When 12-year-old Lilah’s struck by lightning at her mother’s wedding, she wakes up hearing her deceased grandmother Dora talking to her. Lilah’s afraid she’s going crazy until Dora explains, “[w]hen the lightning hit you, it was like someone switched on a radio and I was tuned into your channel.” Soon, Lilah’s channeling lots of dead people like Serena, her music teacher’s sweetheart; Priscilla, a famous fashion designer; and Marion, the cafeteria lunch lady for 49 years. Overwhelmed with advice and requests from talking ghosts who are simultaneously irritating and invasive, Lilah confesses her psychic power to her best friend, Alex, who thinks she should earn money doing readings. But when Lilah tries to give a message to her crush, Andrew, from his deceased father, things go terribly wrong. Gradually, Lilah learns how to convert her psychic pals into allies and channel her powers positively, turning a disastrous school fundraiser into a success, winning Andrew’s trust and admiration, and helping her father find romance. In a fresh, frank and funny first-person voice, Lilah tells of her ghostly encounters from the perspective of a normal Jewish girl coping with abnormal powers. Lilah Bloom is just your average seventh-grader: she likes shopping, groans about math tests, plays the drums, and can’t wait to finally turn 13. Her biggest problem in life is worrying about how lonely her divorced dad seems. When her mother remarries, Lilah gets to be a bridesmaid. The day is perfect until storm clouds roll in. Lilah is standing just under the canopy when lightning strikes and suddenly everything goes black. When she wakes up, Lilah finds herself in a hospital bed with her mother and father standing by. But they’re not the only ones in the room. Lilah has barely recovered from the news that she was hit by lightning when she hears a familiar voice: Bubby Dora, her paternal grandmother. What’s so surprising about that? Bubby is a ghost. Lilah quickly discovers that she can hear the voices of all kinds of dead people. Some, like Bubby, are people she knew, while others come to her in the hopes of connecting with loved ones they’ve left behind in the world of the living. Lilah learns to use her new talent to help those around her, including her lonely father and her very own crush, a boy named Andrew Finkel.